In the latest round in a long-running battle, the D.C. Circuit has upheld EPA’s foot-dragging on regulation of emissions from large marine diesel engines against a challenge brought by the South Coast Air Quality Management District, Santa Barbara Air Pollution Control District, and Friends of the Earth. 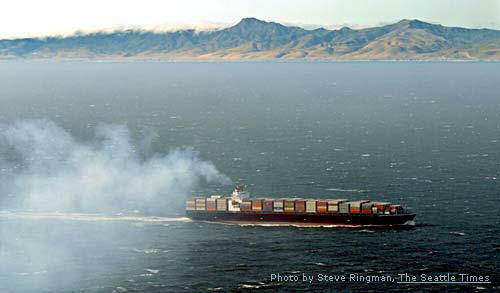 Large ships are major sources of air pollution along the Southern California coast. According to Santa Barbara APCD officials, marine shipping is currently responsible for 40% of NOx emissions in Santa Barbara County, and that proportion is expected to rise as trade with Asia increases. Clean Air Act section 213 mandates that EPA set standards to reduce emissions to the greatest degree achievable as quickly as emission reduction technology can be developed. In 1994, EPA set initial standards based on the technology then available, with a promise to develop new standards based on more advanced technologies by April 2007. The D.C. Circuit upheld that decision at the time, in Bluewater Network v. EPA, 372 F.3d 404 (2004). Instead of meeting its self-imposed deadline, however, EPA in 2007 extended that deadline to December 2009. At the oral argument the petitioners allowed that they would not be objecting to the new deadline if they could be sure the EPA would adhere to it. Throughout George W. Bush’s two terms, the air districts have been prodding EPA to set more stringent standards for large marine engines. Perhaps now they truly can expect EPA to live up to its commitment. The shipping industry successfully attacked California’s attempt to regulate fuel use in marine vessels, claiming that state attempts to do this are preempted by the federal Clean Air Act. See http://www.americanmaritimecases.com/2008AMC626.pdf. It’s funny how you don’t see any industry plaintiffs in the case reported in Holly’s post — where the air districts argued that federal EPA should go ahead and do exactly that. Why do you suppose that is?